Following up from last year’s Look Good Riddim, Wallabee productions drop their second release this April with Reble World Records’ BabyBoom on two brand new tracks with exclusive remixes from established Bass music producers. 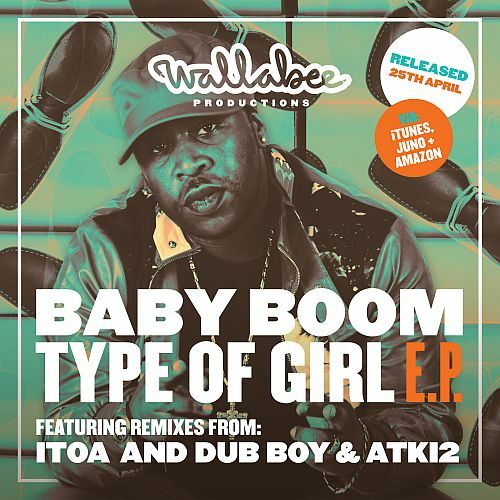 “Type of Girl” meshes swung beats and modern Bass influences with the regulated and imposing ragga delivery from BabyBoom. With a pulsating bass driving the riddim onward beneath Boom’s vocals, this tune is built for the hypest of Dancehall sessions. The second track showcases BabyBoom’s sweeter side as he promotes a positive message with the conscious “One Day”, a stark contrast from his party style, it really brings out his versatility as an artist. First up on remix duty is Bad Taste Record’s Itoa taking “Type of Girl” down a darker path yet still preserving its infectious rhythmic style. Having just put out his French Cola release to wide acclaim, expect to hear a lot more from this exciting London based producer. Stripped down, but retaining a punchy edge throughout, Itoa’s reworking draws out the more menacing sounds in the original cut with plenty of Bass. Switching the same track up entirely is Bristol based production duo Dub Boy & Atki2. Renowned for their high energy dancehall and soca remixes and productions, you can also find them at parties and festival lineups as “The Dutty Inspectors”. Pushing up the tempo and adding in some carnival inspired whistles, you shouldn’t expect anything less hype from this soca obsessed pair.